Most plants need sunlight to grow and flourish, but many species have limits to how much rays they can handle. Exposing plants that prefer limited or moderate amounts of sunlight to the sunniest patches of your garden will only set them up for failure – and you for disappointment. Fortunately, there are plenty of flowers that thrive in environments with full sunlight. If you have a light-drenched lawn to fill, consider planting these flowers that love full sunlight and watch them thrive in your garden. 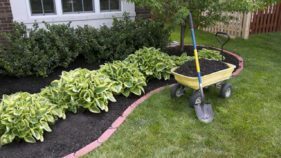 Although these flowers can be planted as perennials, those who cultivate them usually treat them as annuals, therefore replanted every year allowing for adjustment in placement in the garden. While gardeners who live in tropical climates that offer year-round heat and sun can simply grow these plants directly outdoors, those working in colder climates may have to get them started in an indoor setting. Both the standard sunflower and the Mexican sunflower thrive in full sunlight. Unlike traditional sunflowers, however, Mexican sunflowers can be replanted as perennials. 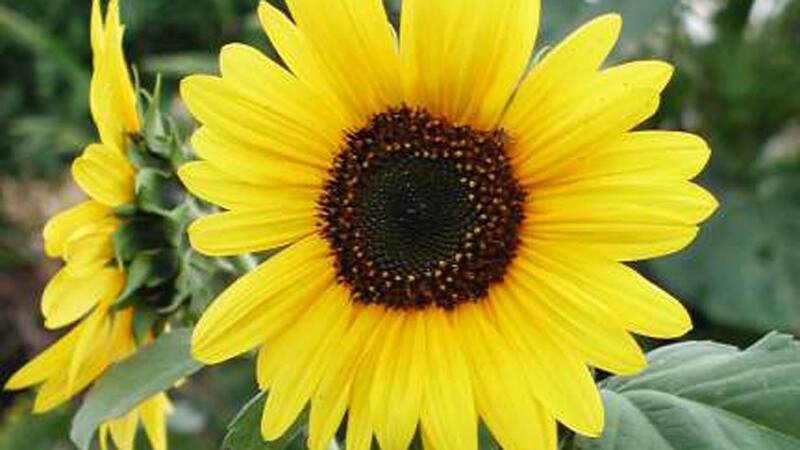 The standard sunflower is considered an annual flower, therefore replanted every year. 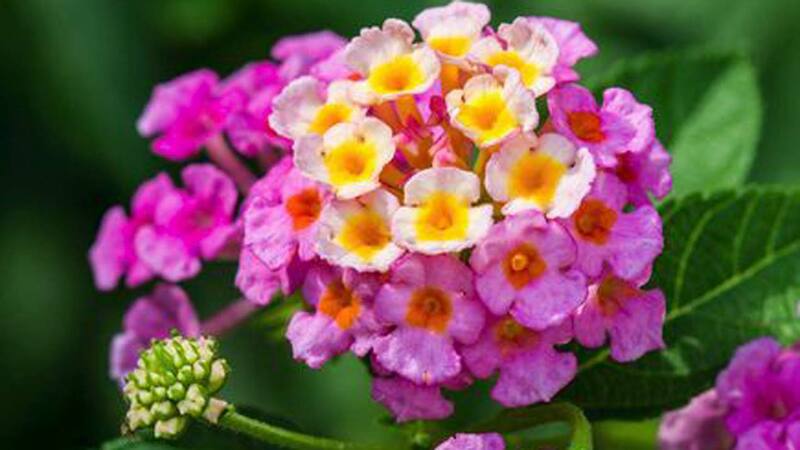 To add a real pop of color to your garden, bring a lantana plant. These unique flowers grow in rich, creamy tones of purple, pink, red, orange and yellow, and can be cultivated in bush or tree form. It used to be that lantanas (Lantana camara) available to gardeners easily become weedy and somewhat unkempt looking, but today there are better-behaved assortment of trailing hybrids and species perfectly suited to growing as ‘spillers’ in pots and hanging baskets. In addition to the commonly found hybrids with red and yellow flowers, lantana montevidensis, produces prolific lavender flowers on trailing systems. All lantanas are irresistible to butterflies, so much so, in fact you will have a hard time getting a single photo of full grown plant without finding a butterfly photo-bombing your shot. While lantanas are said to be drought-tolerant plants for the garden, container grown plants will wilt if potting mix is allowed to dry out. They are tricky as houseplants because they love humidity, but will easily rebound when planted outdoors. Another colorful, sun-loving blossom to consider is the petunia. These stunning flowers, which can grow up to 24 inches, prefer sunny climates with lower levels of humidity and mild rainfall. Deadheading these plants help to maximize their flowering potential. Zinnias are considered one of the best flowers for gardens situated in full sunlight. Zinnias originally natives of Central America and Mexico, can be found growing and thriving naturally in regions with high temperatures. Zinnias are great for trimming and using in bouquets and floral arrangements since their flowers grow back quickly and they come in a variety of colors – from bright gold to pastel purple, there is a shade of zinnias perfect for every garden and floral design. While these colorful flowers are native to California, you don’t have to live there to enjoy their beauty. As long as you live in a sunny warm climate, and equipped with soil that isn’t too rich nor too wet, good drainage, you can grow poppies of your own. California poppies can be grown in shades of orange, cream, pink, red and yellow. The royal name “princess flower” wasn’t given to Tibouchina urvilleana by accident, and it would be a truly noble addition to your garden by virtue of its velvety cool green leaves alone. But when you start to see those silver and downy flower buds at the tip of each stem, stand back and enjoy the procession of deep indigo purple blues with an intensity matched by few other flowers. Even the curled stamens take on a feminine quality if you imagine them as eyelashes. Princess flower is also available in a component dwarf form, and its relative Tibouchina heteromalla has impressive fuzzy leaves over six inches wide. As tropical plants they bloom all year-round when grown outdoors. With sage green, velvety leaves and frequent bursts of intense red puffballs of flowers throughout the year, bottlebrush has to be an all-time favourite flowering shrub – particularly the dwarf selection known as ‘Little John’. Most bottlebrushes (Callistemon species) are ideal for training as small trees in containers but ‘Little John’ stays so compact and low that it may be used as a perennial shrub amongst other plants in the container garden. Bottlebrushes are relatively drought-tolerant but should be watered thoroughly if grown in containers. Tropical hibiscus brings a flamenco vibe to the patio and container garden even for beginners. There is more to the hibiscus family than your classic garden red variety. Red Chinese hibiscus (Hibiscus rosasinensis) and each of these plants will thrive in the dog hot days like hula girls at a luau. 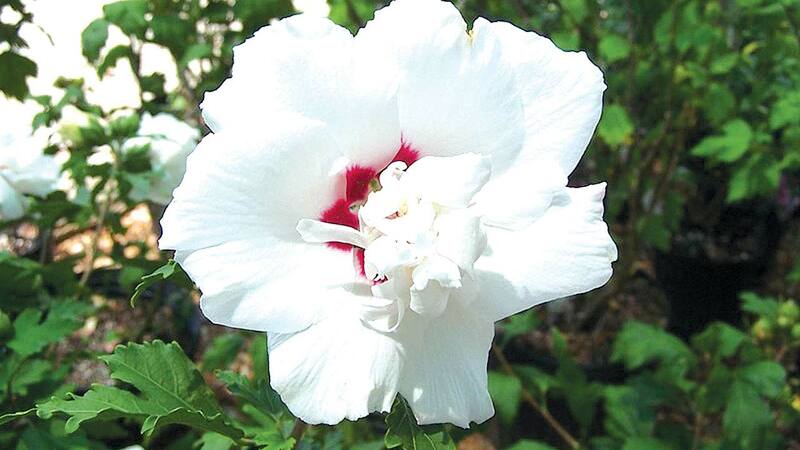 ‘Snow Queen’ is popular for its variegated white, pink and green leaves but its coralline flowers are as impressive as any red hibiscus. ‘Haight Ashbury’ is grown for its finely divided burgundy leaves like Japanese maple, as it is for its matching burgundy flowers. 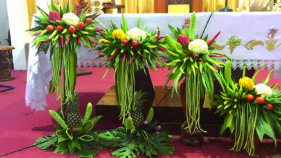 Each variety has an upright habit, making them excellent as centerpieces and focal points in the container garden. Just be sure to give full-grown and arching specimens a little bit of support by inserting garden stakes in the container’s potting mix and loosely tie a loop of string around both the stem and the plant. Like many tropical flowers, the brilliant colors of hibiscus are a beacon to butterflies and hummingbirds. You can choose varieties that complement any color scheme as blooms come in hot shades like yellow, orange, pastels pinks, white and more. Looking like a cross between an artichoke and a thistle, protea flowers are a staple in tropical flower arrangements due to their very long-lasting cut blooms. 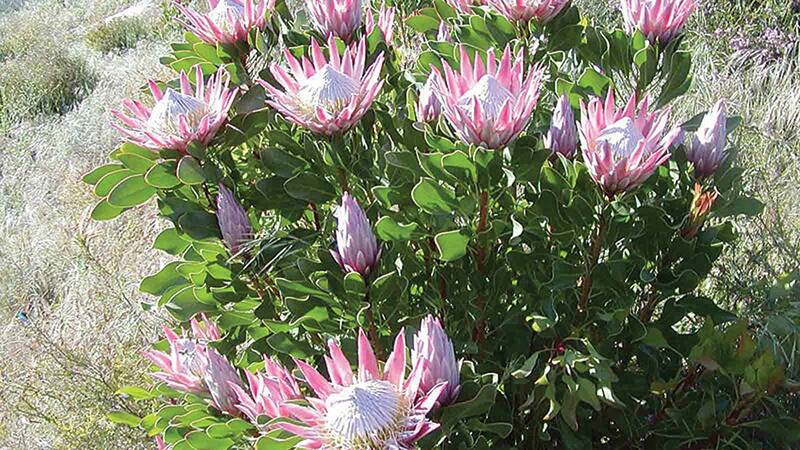 The South African natives sport blossoms that are fuzzy, leathery, and quite drought-tolerant. Plant proteas in a sandy potting mix, and water once or twice a week. There is nothing like a few pots of pink, purple, and red pentas to bring butterflies and hummingbirds flocking to your deck or patio. Clusters of star-shaped flowers appear on 12-inch tall plants, and ask for nothing more than full sun, well-drained soil and average water. With names like cigar plant, (Cuphea ignea), candy corn plant (Cuphea micropetala) and batface flower (Cuphea Ilavea), you can already tell that these plants are lots of fun. Best of all, Cupheas all produce loads of narrow hummingbird-attracting blooms on upright stems even throughout the hottest days. Place taller ones at the back of a sunny container garden or use them in combinations where their finely-texture foliage and flowers can pop against broad-leaved ‘thrillers’ such as cannas. 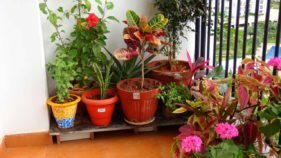 Tropical flowers bring a sense of “more” to your garden: more color, more fragrance, more size, and even more wildlife like butterflies and hummingbirds and their exotic beauty and mysticism.All these beautiful flowers are easy to cultivate and will brighten your space with sunny colors of the rainbow. Enjoy.